"Most bread produced in factory bakeries in the industrialized world is made without the critical step of fermentation.....Dough conditioners, flavorings, processing aids, gums, fats and additives are used in an attempt to save one precious thing, TIME....They mix, shape, and bake a loaf in less than an hour. A baker using traditional methods and actual fermentation may take up to 72 hours." by Martin Philip, head baker of King Arthur Flour, "Breaking Bread" (emphasis added). Yes, fermentation is nature's gift to humans. From cheese, wine, kimchi, soy sauce, and chocolate to bread making, the list can go on and on. No matter where and what kind of culture, fermentation is a critical and beneficial food making process. It takes time for all the microbes--yeasts, bacteria, etc.-- to break down the raw ingredients (milk, grape, napa, soybeans, flour, cocoa bean) to a more digestible and tasty final product (cheese, wine, kimchi, soy sauce, bread, chocolate). 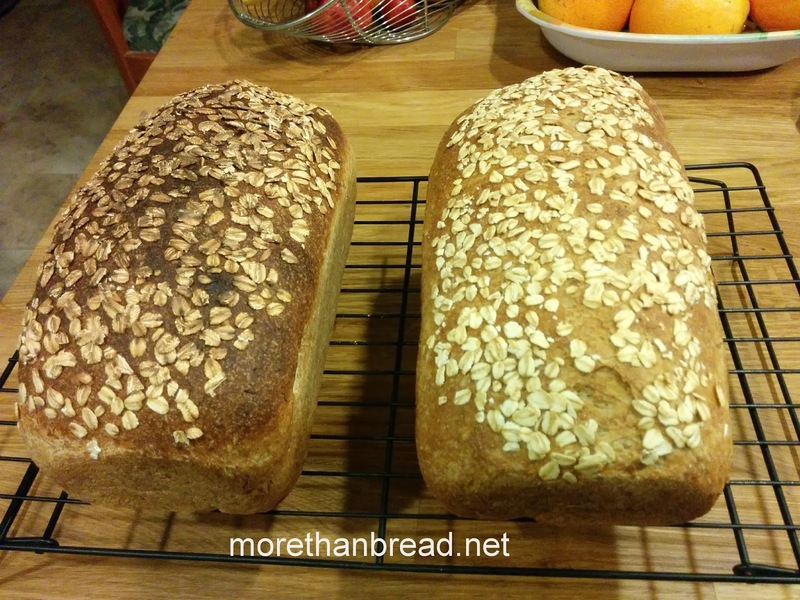 I have tried different recipes for making oatmeal bread and this is by far the most satisfying. Other recipes give a very wet dough and in turn yield a heavy and dense bread. This one has the right texture and is very flavorful. It uses honey and vegetable oil instead of sugar and butter. For a completely dairy free version, substitute milk with water. No stand mixer? No problem. 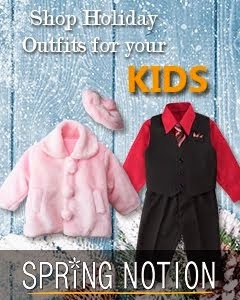 Tired of kneading with your hands? No problem. Follow the steps below to make an easy and yet nutritious and tasty bread. Mix all of the above in a bowl and let it soak for at least 2 hours, up to 16 hours or overnight, at room temperature. 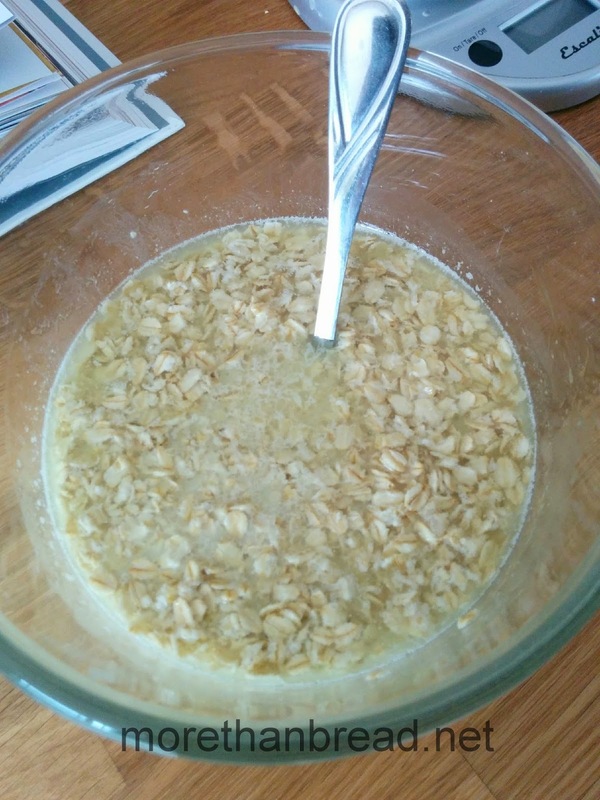 1) In a large mixing bowl, combine the oat soaker, flours, yeast, and water. 2) Add salt and mix until there is no dry flour in the bowl. No kneading is necessary. Cover with plastic wrap and you will have a rough dough. 3) Fold and stretch the dough as pictured every 20 minutes, for a total of 3 folds over an hour. 4) Leave it alone to ferment at room temperature (70-75F) for another hour. 4) Preshape the dough and let it rest for 15 minutes. 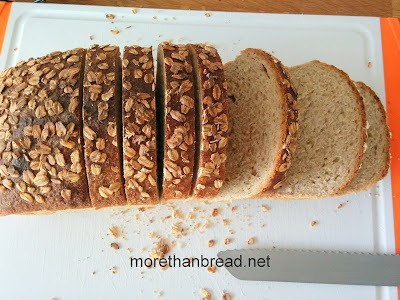 5) Spray a 9x5 loaf pan with oil. 6) Shape the dough so that it is the same length as the pan you're using. Moisten the surface of the dough by spraying it with a little water. 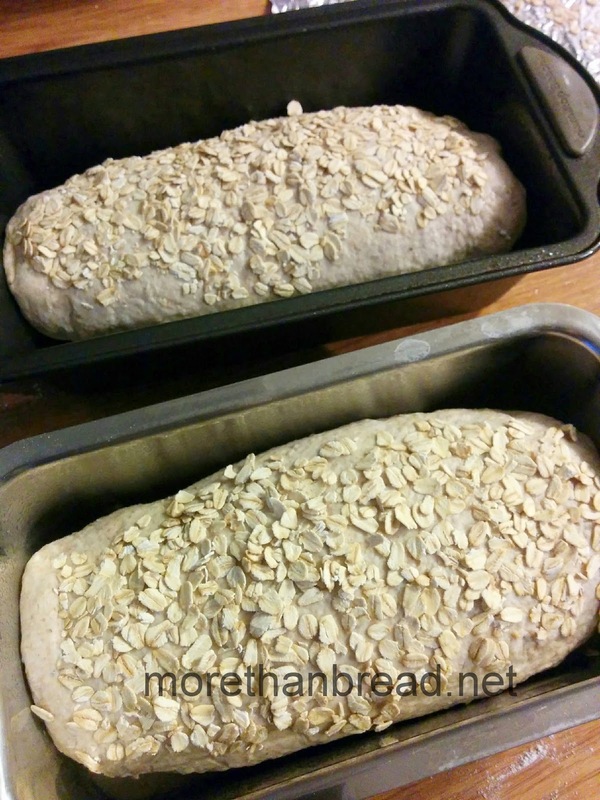 Roll some oats on top to make the crust. Place onto the loaf pan, seam side down, oats side up. Cover and let it rise again for 50-60 minutes. 7) Preheat oven to 425F. Bake for 35-40 minutes. 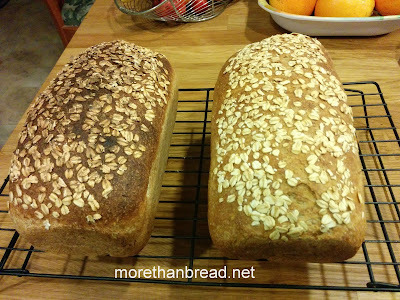 Recipe modified from Breaking Bread by Martin Philip, Head baker of King Arthur Flour. Note: I usually put 2 tbsp chia seed or flaxseed (ground or whole is fine) to the dough for added nutrition. 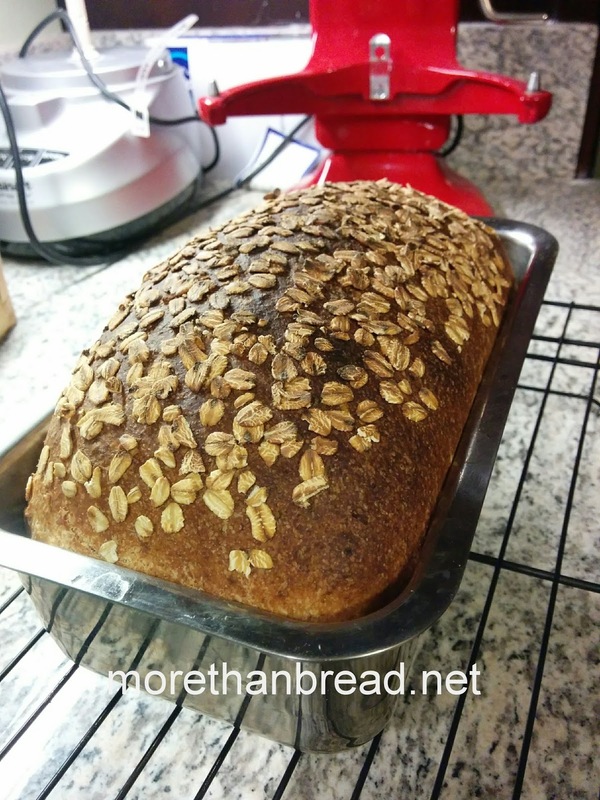 Hi Phoebe, I tried this oatmeal bread and followed your method. It came out really healthy ,soft and moist. My husband loves it. Thanks you to much to teach us the wonderful the bread . You're welcome Pat. I like this recipe very much too. It has become our daily bread.